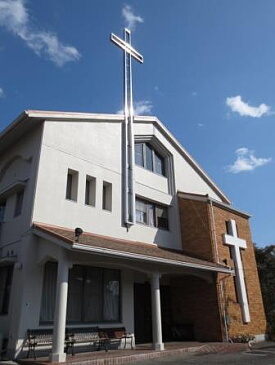 The Nissei-chuo Catholic Church is a parish in the Osaka Archdiocese of the Roman Catholic Church. It is located in Inagawa Town, Hyogo Prefecture. There are about 400 parishioners, who come from the surrounding areas of Kawanishi City, Inagawa Town, Toyono Town and Nose Town. The mass is celebrated in Japanese, however we do have the printed weekly missalettes in English to help you follow along. Children are always welcome, and there is a cry room for use as well. If you would like to speak to someone in English, we can arrange that for you, as a few of our parishioners do speak English. The church is open from 10 am to 4 pm on weekdays and 9 am to 1 pm on Sundays. Our parishioners who speak Engilish will help you on Sundays if you need assistance. 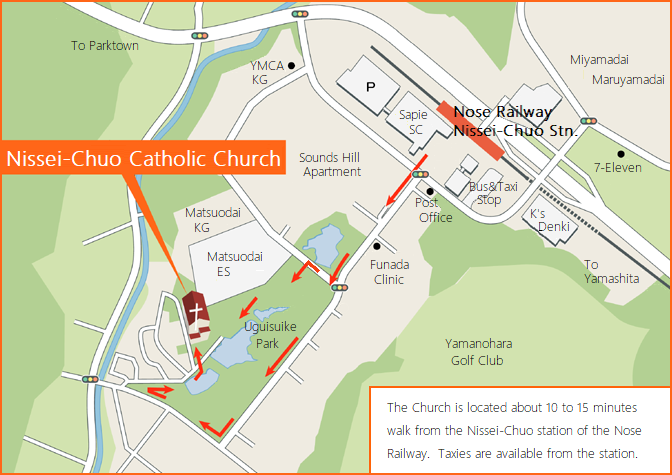 The church is located about 10 to 15 minutes on foot from the Nissei-chuo station of the Nose Railway. There are parking spaces available in the church. Taxies near the station are also available. Just say, "To the Nissei-chuo Catholic Church near the Uguisuike park, please."